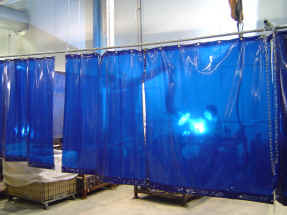 PVC Strip curtains provide an effective solution for problems related to environment control. They are in fact the cheapest and excellent solution for problems that is faced in providing a safe workplace for everyone. They play a pivotal role in controlling temperature loss, wind, harsh weather, dust, birds, insects, noise, pollutants and humidity. We provide wide range of PVC strip curtains and can be tailor made for your specific requirements. They are also used as partitions to create privatized restricted area. PVC curtains are well known for low maintenance and high durability, they are flame retardant, highly impact resistant and suitable for any harsh work environments. Eliminates temperature loss thus conserving energy. Protects from Chemicals and pollutants. Transparency ensures maximum visibility and enough light to pass through. Protects from birds and Insects. Cuts Noise from heavy machinery. Protects from UV rays and welding sparks. Welding bays or enclosures made out of Pvc strip curtains controls (UV)ultraviolet rays, noise, dust or sparks in welding and machine shops. They also allow easy access in and out of the welding bays. We offer you the best quality pvc strip curtains at affordable prices.